No matter how good of a high school student athlete you may be, you must find a way to balance it all between athletics, academics and your social life. 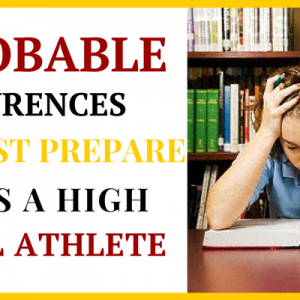 Learning how to balance it all can be tough and while persevering through the daily rigors of being a student athlete, there are common occurrences you must prepare for or simply acknowledge. So what exactly can you bank on being a common occurrence? Check out our below list. Accept that after you finish reading this, you have been warned. Getting recruited is perceived to be the Holy Grail jump a successful student athlete makes to college. However, according to stats, less than 3% of total high school sports participants achieve. There are right and wrong (hyperlink to 5 ways to tell you are/not being recruited blog) ways to tell whether you are being recruited or whether you are not being recruited, but the reality is the stats are against you. Couple this with the fact that only 1% of those recruited actually receive the coveted full-ride scholarship and the numbers really stack up against you. By no means are we stating this to rain on anyone’s parade but it is important to understand that there is life beyond sports. Embracing your “Option B” – or “Option A” for some of you – may lead to a life more rewarding than any single sport can provide period. The wise ones take the key lessons obtained through sports and apply it positively to everyday life, whether that is in or outside of sports. If you have ever played sports and you made it through high school playing at the varsity level without any injuries, consider yourself lucky. According to one report, high school athletes suffer 2 million injuries, 500,000 doctor visits and 30,000 hospitalizations each year. That equates to about 1 in every 5 kids who are involved in a sport or activity will suffer an injury over the course of a year. That’s a lot of kids who have anything from sprained ankles to more serious injuries like broken bones and concussions. The top three sports that cause injuries for males are soccer, hockey and football. For girls, blame soccer, gymnastics and dance as the top three culprits. Whether you do dynamic warm ups* or cool downs to avoid being sidelined or nurse your injuries with a few key products carried in your bag after a game, many of student athletes will have to cope with it one way or another. Let’s face it, there will be times when you have a game or practice and you are so tired nothing is left in the tank for homework or assignments. You will feel so under the gun that you could fall asleep within it’s barrel of darkness and fade into the abyss. And that’s what makes being a student athlete so tough but yet rewarding – it’s the thought that over the course of the year, you can achieve anything you set your mind towards on countless hours of less sleep than your counterparts. Don’t get me wrong; sleep is a necessity and important aspect to your livelihood and we provided a post on how to develop healthy sleeping habits to improve your life as a high school athlete. But if you are going to excel and strike a healthy balance between being a great athlete, achieving stellar grades and having a good social life, the stats state that you will most likely sacrifice some sleep to get there. I can’t tell you how many times this has happened to me personally or to other young athletes I see. Part of being a functional human being and responsible citizen of society is learning how to have some social aptitude, especially when the things become tough and stressful. Life is all about balance and you need a handful of people that you can count on to pick you up, motivate you to be your best and to share great experiences with. All of which brings me to my last and final point on probable occurrences as a student athlete. For student athletes, the common mindset is to take the lone wolf approach and lead with an “If it’s to be, it’s up to me!” attitude. However, they do so under-estimating the hours it takes to hone the necessary skills to excel at your sport, the dedication, and application to learn and execute upon something new you learned in school or they undermine the CEO-like organizational skills it takes to balance it all. At some point, you have to put your hand up and get the help you need from your support groups as mentioned in the 4th point above. Most of us haven’t learned how to balance it all and for those that have, they have likely done so leveraging tutors, mentors*, or other influencers to aid them along. 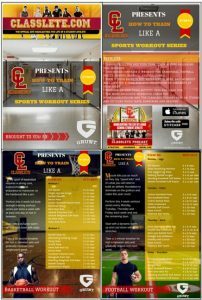 So whether it’s buckling down with an academic tutor to pick up your GPA, staying after practice with a coach to firm up weaknesses in your game, or utilizing the resources available here at Classlete.com, do what it takes to make your glory years of high school count. Although having an “Option B” plan outside of sports, coping with injuries, lacking blissful sleep, checking in with your support system or even seeking additional help may not live up to be the glamorous aspects of being a student athlete, the faster you find ways to cope with these realities, the better your success on and off the field of play. Tell us in the comment section below, what inevitable things have you had to deal with while being a student athlete?